SOURCE: Sent by author, in exchange for an honest review. PURCHASE THE BOOK FROM THE BOOK DEPOSITORY HERE. In just two weeks, Emily must undergo the blue crystal initiation ceremony or face death from the secret order that protects it. But is she ready to spend eternity with the beautiful and irresistible Theo de Lucis, or can best friend, Seth, offer an alternative? And can she stay alive long enough to make the decision? As Emily considers her future, she becomes an unwitting pawn in a dangerous game of life and death, caught up in a supernatural world of ancient enemies, old grievances and dark forces. Tested to the limit, she must draw deep to ensure her survival. 'True Blue,' is an absolutely brilliant follow up to 'Blue Moon.' It is heart wrenching, poignant and quite frankly spell binding. What I liked the most is that the characters still have very complex but also compelling ties to each other, the plot is still as action paced and enthralling as the first. Emily, (the main protagonist), has to make a life changing decision. She needs to decide if she could spend the rest of her life with Theo, but is that really what she really wants? She then has the sheer doom of the 'Blue Crystal Initiation Ceremony,' impending on her- and she could face death if she doesn't go. Will she become wrapped up in the paranormal world, as things will get more treacherous and perplexing as time goes on? I did really enjoy immersing myself into the characters and the plot: I could almost feel myself being woven up into it. 'True Blue,' felt like a guilty pleasure, as I could dig my teeth right into it, enjoying all of the supernatural elements immensely. You can see the plot happening before your own eyes as a reader: it makes all of the difference when you can see it yourself. 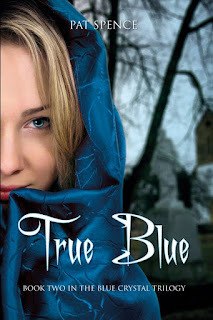 With mysterious characters, an intricate plot and nail biting action, 'True Blue' does not disappoint fans of the first book- and makes them every more excited for the final instalment! An impressive 4 stars, and a definite must read for any fans of supernatural novels. See my review for 'Blue Moon' here.